Nehlen is running on a pro-America platform arguing, in contrast to Ryan, that the needs of American citizens should be a Congressman’s first priority. If elected, Nehlen would likely join the pro-America wing of the GOP Congress led by Sen. Jeff Sessions and Congressman Dave Brat. By contrast, Speaker Ryan is the ideological leader of the globalist wing of the Republican Party. Ryan emphasizes that the needs of foreign citizens are equal to the needs of American citizens. In fact, Ryan has previously suggested that U.S. lawmakers must put themselves in the shoes of foreign citizens and then put forth legislative proposals that what would best serve the interests of these foreign citizens. Ryan’s view, which is dominant among the GOP establishment, reflects the belief that Americans are only part of many interest groups that a Congressman ought to consider when crafting legislation—even as he negotiates with other countries, which always put their citizens first. Yet because Ryan’s position does not poll well, he is not sharing with his constituents the actions he has actually taken on immigration, or what his actual agenda is. Instead, Ryan is using a conventional tactic of trying to position oneself as a border security hawk in the days and weeks before the election, while in reality doing the exact opposite. In this case, Ryan is the leader of the anti-borders movement in Congress. The challenge for insurgent candidates like Nehlen is that Ryan’s cozy alliance with globalist special interests not only gives Ryan much of his power, but it also provides him with unlimited financial resources to run ads in his district that portray him as being the opposite of who he is. Thus, ironically, Ryan can flood his district with ads and mailers portraying himself a border hawk because of the relationships that he’s built with wealthy global interests by trying to dissolve national borders. 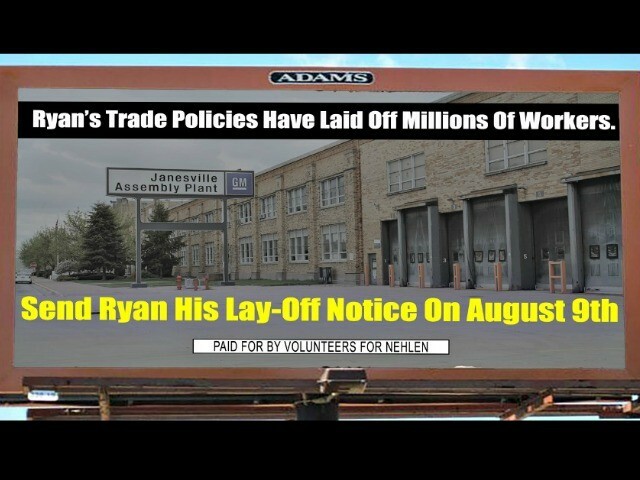 Since Wisconsin voters sent Paul Ryan to Washington, Wisconsin has lost one fifth of its total manufacturing jobs. Since they sent Ryan to Washington, the U.S. has imported a population of immigrants that is nearly three times larger than the entire population of Wisconsin. A few days before a 31 year-old Wisconsin cop with 13 years of service was “viciously attacked” and shot at multiple times in Milwaukee, Paul Ryan announced his plan to bring up legislation, immediately after his re-election, that would release violent criminals from prison and back onto the streets—including thousands of criminal illegal aliens. Critics say that Ryan’s “jailbreak agenda” would not only endanger minority communities who would be at the receiving end of increased violent crimes, but would also further endanger our nation’s law enforcement officers. 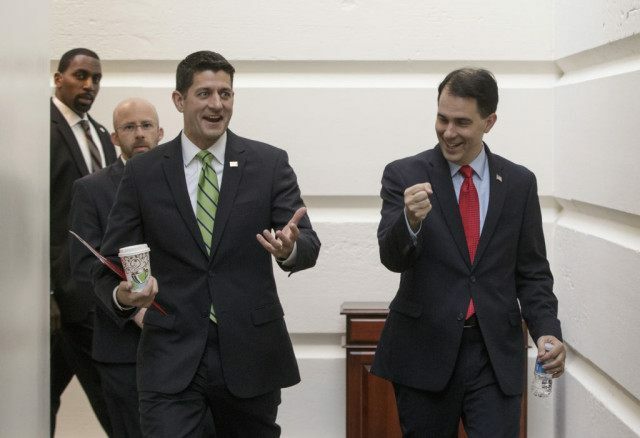 While Walker tells Wisconsin voters that Ryan “makes us proud every single day,” Walker did not explain why he was proud of the hours and days Ryan has poured into pushing to fast track the TPP, working hand-in-hand with Luis Gutierrez to enact amnesty, or becoming the leading champion of Barack Obama’s crime agenda. It’s perhaps indicative of Walker’s priorities that the Wisconsin Governor decided to offer a full-throated endorsement of pro-open borders Ryan in his Congressional primary race before offering a similarly strong endorsement of the Party’s presumptive nominee Donald Trump, who wants to secure the border and enforce U.S. immigration law. In his letter, Walker asks Wisconsin taxpayers to open their wallets to help Ryan raise $110,000—even though the House Speaker already reportedly has roughly $10 million cash-on-hand for his race. Interestingly, recent analysis conducted by ProPublica found that Ryan “raises money from a vastly different set of political action committees than members further on the right.” The analysis shows that Ryan’s donors are more likely to also be Democratic donors than Freedom Caucus donors. Walker’s letter similarly does not explain what specifically has been “ugly,” “deceptive,” or “nasty” about Nehlen’s campaign against Ryan. In recent weeks, Nehlen has gained traction through his focused attacks on Ryan’s longstanding support for open-borders trade and immigration policies. Earlier this month, Nehlen held a press conference in front of Ryan’s personal border wall in which he criticized Ryan for protecting his family with a border wall while denying the American people that same protection. 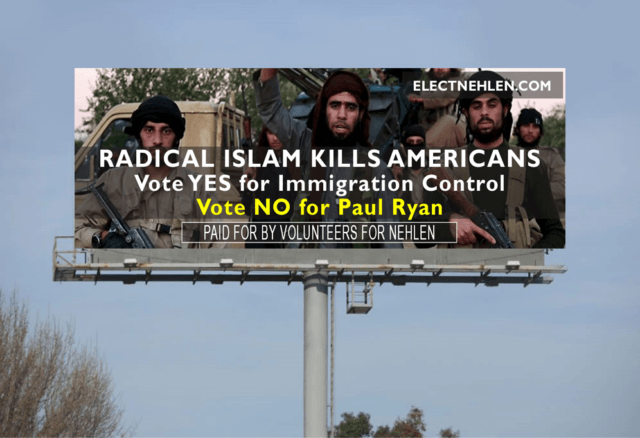 Nehlen also criticized Ryan for repeatedly ignoring the pleas of the American mothers and fathers, who have been forced to bury their children as a result of open borders. When asked about Nehlen’s press conference, Ryan suggested that it was “petty” to stand outside his personal border wall and discuss protecting the interests of American families. 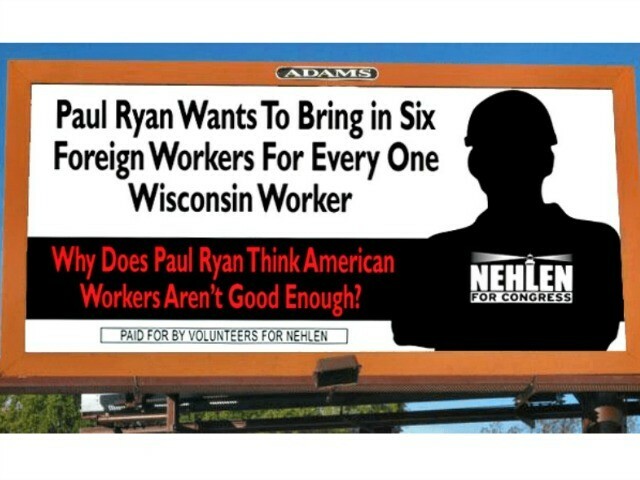 Nehlen has also launched a series of UKIP-styled billboards, which vividly portray the implications Ryan’s policies have for American families and workers. This entry was posted on July 26, 2016, 9:59 pm and is filed under Elections-Obama, Uncategorized. You can follow any responses to this entry through RSS 2.0. You can leave a response, or trackback from your own site.